I have posted before about how much I love infographics. We now have four different departments getting their students to manipulate data using infographics: Art, Science, PD/H/PE and Food Technology. Some of these started out rather basic but the students are now evaluating their work for quality control, ease of reading and comparisons to professionally produced graphics. This all started with a couple of conversations about developing activities that facilitate deeper levels of understanding. We have been building the infographics using the Macbook applications Pages and Numbers. Some of the students with drawing skills are hand drawing particular components and then scanning them into their documents in order to achieve the desired effect. We modelled the process by developing our own little infographic based on the data that we collected from our students prior to the rollout of our 1-to-1 laptop program. The questions were based on access to family devices not just ones that were their own. This will be an ongoing analysis of the student's access to technology and use of digital devices for both social and educational purposes. 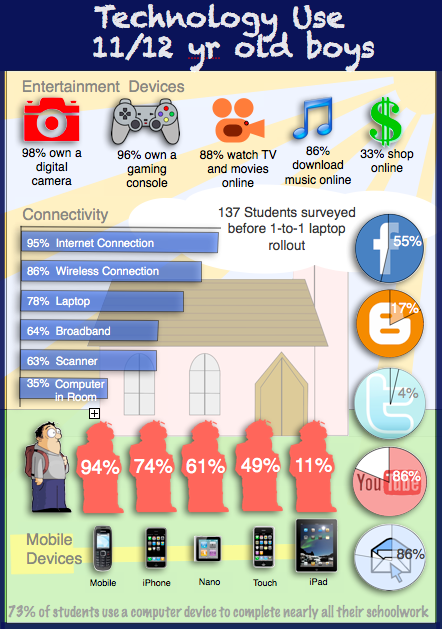 Infographic How Social Media is? I am very impressed with the infographic you created.It is visually stunning. I am working on helping our students create their own infographic as well. What program did you use to create the above graphic? Where do you get the icons and images? Thank you in advance. Yes, I would like to know how, too! I am interested as well! As well as best practices in infographic design. Thanks for the positive feedback, we were a little unsure about this infographic. We wanted it to be read within a school context. A few people have asked about how we constructed this, so I might put a post together that explains our techniques. We used Pages/Keynote/Pixlr. We did this without addition software as all that I have researched so far have been either very expensive or involve a big learning curve - which for students kinds of defeats the purpose. Where did you get the icons/graphics through? I am collecting sites for students to be able to use. Thank you. Most of these icons were from free clipart or icon collections. Some are from copyright free or public domain icon sites. Some were modifications of icons we found. These changes were made in Photoshop Elements, but you could do the same with Pixlr. I have a Starter Sheet for Pixlr that I will also put up on the blog. Greg - This is a great use of technology in the classroom. Many educators seem to struggle with unique ways to integrate technology into their classroom. This infographic technique can be used to create posters, graphs, diagrams and other groupings of information to get students actively interacting with the material and use their creativity at the same time. As well as we can easily provide the particular oxen give food to Cheapest GW2 Gold. Or we could consider pails of water and pour the breakfast cereal. No matter what carry out - every single motion tavern floods the guts a bit, it's loaded Diablo 3 Gold Farming, the duty is recognized as accomplished and we received the actual compensate and also via postal mail karma points. Timely infographic, now a days kids born with ipads on their hands and they do not explore the world by themselves but through these tech gadgets.